Preheat oven to 375F. Line a 12-cup muffin tin with paper liners. Combine the flour, baking soda and salt; set aside. In a small bowl, mash two bananas with a fork. In a large bowl, beat the remaining bananas and sugar together. Beat in butter and add the eggs, one at a time, beating well after each addition. Beat in vanilla. Mix in the dry ingredients just until blended. Fold in the mashed bananas and blueberries. Spoon batter evenly into the prepared muffin cups, filling about 3/4 full. Bake 25 minutes, or until a toothpick inserted in the centre of the muffins comes out clean. 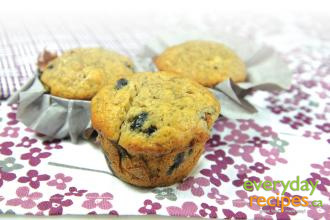 Remove muffins from tin and place on a wire rack to cool. Makes 12 muffins. I tried this recipe and shared half the muffins with a friend. We both found them excellent. Took longer than the suggested time to bake, but that was no biggie.